I went with my family to Cap Salou in July for a two week holiday. We booked through Traveltext. I would firstly like to talk about the hotel and experience whilst we were away. From the moment we arrived in Reus, the process from getting to the hotel, to checking in was very smooth. We were met and the airport by a rep and transferred by private bus to the hotel. We arrived early, so rooms were not ready but we were able to store our luggage and enjoy the pool. Once the rooms were ready, we were checked in and shown to our room. It is not always easy getting a room big enough for 5 people but our apartment was excellent with ample space. It was clean, fresh and had all the amenities we needed. The service at the hotel was fantastic. I would particularly like to mention the dining staff who do an excellent job dealing with so many people. We never had to wait too long to be seated even at peak times. First class services every night. The food on offer was also fantastic. Each night had a different them but always had options for all dietary requirements. The entertainment for the kids (and adults) was fantastic. There was always something going on throughout the day for the kids that kept my kids busy. I take my hat off to the staff who run the kids entertainment. They were always full of energy even after working long hours! The evening entertainment was great to keep the kids entertained and there were some great nights of live acts for the parents also. The location of the hotel was good. It was close to a couple of beaches and not directly in Salou, which was very touristy! We walked to Salou from the hotel which only took around 30-40 mins. The walk along the beach is worth it. There is also public transport links outside of the main entrance and taxis are reasonably priced. I would also like to mention Traveltext, the company who we booked through. The services was excellent from the outset. We were given many options based on what we required, which made it easy to finally select the right hotel. The traveltext staff are extremely helpful and accommodating. Nothing was a hassle to them. I will certainly be using them again to book for next year. Hotel tip: Request a room that is facing away from the pool area if you want quiet at night. The rooms facing out have great views and are also very quiet at night even though there is live entertainment going on. Me and my partner stayed here for 1week,and the hotel was fantastic, very clean, plenty to do, friendly staff,3 swimming pools (indoor swimming pool you must wear swimming caps. The only thing I didn’t like) the entertainment for kids and adults was 5*.overall I would 100% go there again and also recommend to anyone. Me and my partner stayed here for 1week,and the hotel was fantastic, very clean, plenty to do, friendly staff,3 swimming pools (indoor swimming pool you must were swimming caps. The only thing I didn’t like) the entertainment for kids and adults was 5*.overall I would 100% go there again and also recommend to anyone. We have just returned from a 7 night stay at H10 Med Village, and couldn’t wait to get back home. Despite the glossy pictures, this hotel is not 4 star quality. 2-Star would be a whole lot closer. If you want to find out why please read on. We arrive at 10.00am after an early morning flight. We had booked a hotel room as shown in the brochure (revamped & modern). We were informed the hotel was full, but we were to be given an apartment after we paid the 60 Euro damages deposit. The apartment we were shown was absolutely hideous, worn out 1970's style decor & furniture. We complained, and then were offered a 'refurbished' apartment - this was just as bad, if not worse. As far as I am aware, a new kitchen worktop and flat screen TV on the wall does not constitute a refurbishment in the UK, but in the world of H10 Med Village – It does. We complained via the reps, who said that they would try and get us into the hotel “if possible”. I kicked up a fuss as they were not doing us a favour, we simply wanted what we had booked and paid for. After 2½ hours of sitting with lots of others in the hotel lobby we were awarded a hotel room and due to inconvenience we could check in at 1pm instead of 2pm but would we please not tell the other guests because they would all want to do it. A free of charge (something that you will not see at the H10 Med Village very often) digital combination safe is located in the wardrobe in every room. There is also air conditioning and the English TV channels are BBC1, CBBC, BBC News 24 & CNN. The bathroom comes equipped with a hairdryer but there is a plug socket next to it if you wish to use your own with a European adaptor. The hotel does have Wi-Fi and it is free of charge, but you can’t get it anywhere beyond the reception area. Fortunately, there are plenty of chairs & sofa because as you would expect. The actual hotel bedroom was a lot more modern, but the same cannot be said for the bathroom, dated tiles, water stains, mould around the bath etc. There is a fridge in the room to keep drinks cool - oh yes 5 Euros key deposit, PLUS a non-refundable 3 Euro charge per day. I went to the bar and asked for a couple of glasses with a few cubes of ice in each one so that we could have a drink in our room before dinner - it came with a charge of 1.10 Euro's. We have never known blatant charges for such essential basics in this way. The hotel has laminated floors in the rooms which is fine, however in the corridor, that is another thing. The constant issue of lack of sound proofing was a major grumble. Every noise, whether it be rooms above, below or mainly in the corridor would disturb anyone. Footsteps clip-clopping at all hours, talking, shouting, screaming and drunk people out shrieking by the pool. The cleaning of communal areas was good, however the same can’t be said for our room, or those of other guests on our floor. The maid was unbelievably miserable and barely able / willing to say Good Morning. Her idea of making the bed was to pull the cover over, don’t worry about smoothing the wrinkles in the sheets. The bathroom barely got a wipe round (the grease from shaving foam in the sink and sun tan lotion around the bath was disgusting).We cleaned it ourselves in the end. For the first time ever in twenty years of travel, we did not leave a tip for the maid. A couple of nice people on reception, and two semi-friendly restaurant managers were the only good staff worth a mention in the hotel. The rest were unfriendly, surly, or plain ignorant. They didn’t try to make conversation with holiday makers. Moving onto the restaurant, there was a good selection for breakfast, all fine. This unfortunately was not the same at dinner time, very samey food, and very little selection. Also it is great if you love garlic, because most fish and meat came with plenty of garlic butter/oil drizzled all over it. Even if you are like us and you don’t mind it, after four days it will become too. Food in the restaurant was never hot, only warmish. They do provide you with a microwave so you can warm it up, because that is what you expect when you visit a 4-star hotel. Although it was not school holidays there were so many people who had taken their kids out of school, it was like being away in August. Kids of all ages, screaming babies, toddlers, infants, children from 0-12yrs, it was shocking. A few were well mannered; however some were plain rude, loud, running around even in the restaurant, unchallenged by their parents or the staff. It made dinner a chore because it was so unruly my partner described it as a “chimps tea party”. As with all other 4-star hotels gentlemen must wear long trousers and a shirt with a collar for dinner to maintain standards. I am pleased to report that the same rule is also explained in the holiday brochures and is clearly written in the hotel directory in each room. The only problem is that none of the restaurant staff / managers challenged guests or upheld the rule. The end result was that people would come down for dinner in their sports shorts, flip-flops, football shirts or vest tops - it was like dining in McDonalds in a “not so nice” part of town. On top of this, it also states both on a notice board in reception and in the room directory, that in reception, all residents should wear suitable clothing - tell that to the people walking through in just their Speedos, or bikini’s, with no footwear. Thank god we hired a car, so we were able to escape hell to the sanity of a sandy beach throughout the day. Oh yes, if you forget to bring your own or prefer not to carry them because of the weight… each pool / beach towel will cost you 20 euros to hire. So for a family of four that is 80 Euros before you have even sat in the sun. If you want to exchange it after a couple of days usage (as most normal people would do) you can - for a charge of 1 Euro per towel, per change. The other great thing was that the weather was fantastic & hot with wall-to-wall sunshine every day. Had it not been perfect, I think we'd have asked for an early flight home. RULE 1 – if you're happy with sub-standard everything or couldn’t care less, book your holiday and have a great time. You will love it! RULE 2 – if you have any kind of standards, or like many people read this website before you make a booking DO NOT go to H10 MED VILLAGE!!! You will hate it! Whichever rule you choose is up to you, but I can guarantee you that as long as we live we will NEVER EVER return or recommend this hotel to anyone. We have been to many 4-star hotels and every single one of them are FAR superior in so many ways. spent a week at the h10 mrd village last August and had a fantastic holiday,the kids 3,6 & 14 loved it and we had booked for this August within a week of getting home. the reception is beautiful and the staff really helpful.the pool areas very clean and the lifeguards are a reassurance,no rowdy behaviour at all.entertainment aimed at kids and they all seemed to be enjoying it. the room we had was massive with a really big balcony,we had 2 bedrooms with enough storeage space for an army !rooms attended every day by the cleaners and towels changed whenever you left them in the bath(a tip id picked up on a forum last year!). the whole experience was fantastic,as i say my kids loved the place and it was the 1st oversea holiday for my 6 & 3 year old. small issues aside the med village would get a massive thums up from me.only 30 days to go!!!!!!!!!! 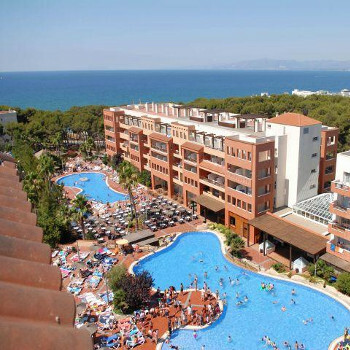 Return visit after last August, the location of hotel is great for families-enough to do without being stuck in the main buzz of Salou itself. Hotel is clean and the cleaner are in the rooms daily-changed towels every day. The pools are clean and have now more sunbeds available than before, pool party in the top pool on Friday mornings had large inflatables for the kids, a great way for them to have some extra fun. My kids love this hotel and we have already booked for June next year for 12 nights. Wi-Fi now available in main reception area which is new too. Hotel was immaculate and perfect for families with all ages of children. Loads of entertainment day and night. Our kids adored all the staff (particularly Jen and Patricia). My son just loved Kids club and was actually begging to go each day! Food was ok although we did find it hard to keep kids eating as they got bored with same choices most days! The 3 pools were spotless and plenty of room for many ppl (although water was very cold in May). The hotel is quite a bit out from main salou and quite uphill which was a bit tiresome for our young kids! However bus stops are right outside hotel. Only fault we had was the prices of drinks and meals. Make sure you take plenty of euro to keep you going throughout your hol. Overall we really enjoyed our hol and would recommend to anyone with kids. Had a nice break, got last min holiday here, and it was ok. The hotel is big, and has 2 great outdoor pools. The staff were very nice, and made you feel welcome. The food was the main problem, not a great choice, and was not hot enough it did get better towards the end of the week, but still not great choice, stayed in 3 star hotels with better choice. Overall it was ok, but i cant say it was a 4 star hotel, stayed in better 3 star hotels. Would go back to hotel, but not half board. Drinks cost a fair bit too! no way are these rooms 4star. living area is tiny. bedroom and bathroom size ok. huge balcony but didnt get the sun and had concrete wall so even if was south facing the wall would block the sun, would however be very safe for children. could have done with a good clean as had only been really wiped over.entertainment not great so we went out mostly. no chance of getting a bed at the pool and even if you did would be mega busy. 15min walk to beach which was nice and clean. sunbed hire at beach was 4euros daily but the man takes the beds in at 5pm. 2euros for can of juice at beach and no shops closby so you really dont have an option. Hotel is lovely. Food is wonderful even my Son who is veggi enjoyed his food thanks to colour coded green. This ment for the very first time l did not have to go with him to choose food. They have a dress code in the dinning room and we did see gentleman being turned away due to trying to get in with shorts. Rooms have very thin walls. 20euro to hire fridge.If we returned would take ear plugs. Everywhere very clean. Entertainment very poor at night but plenty going on the day. Spent 3 days at Port Adventura. Bus outside hotel. Easy to get around.